Look at my hands busying away there. Proper little chef, me. I’d been meaning to have a go at making won ton for ages but kept putting it off, thinking it would be fiddly. But it was suprisingly easy. Yes, the wrappers did tear a couple of times but that doesn’t matter really, this recipe makes loads. It is courtesy of my friend Sheo. 300g or so of Chinese greens – pak choi/bok choi is what I used. 100g chinese chives (although I just used ordinary chives, not having an Asian supermarket handy. You could also use spring onions (scallions)). Okay, finely chop the pak choi or whatever greens you’re using, sprinkle them with salt and set them aside for 30 minutes or so. This is to draw the water out of them. Meanwhile, chop up the minced pork even more, you want it really well minced. Once the greens have sat with the salt for a bit, squeeze them really firmly over the sink to get all the water out. I was surprised how much there was. That’s it, just keep repeating this until you’ve run out of the mixture. Keep the made-up wontons covered so that they don’t dry out. You can cook these one of two ways: you can fry and steam them or you can boil them and make wonton soup. Boiling is probably easier but I steamed and fried them to be eaten as a starter. 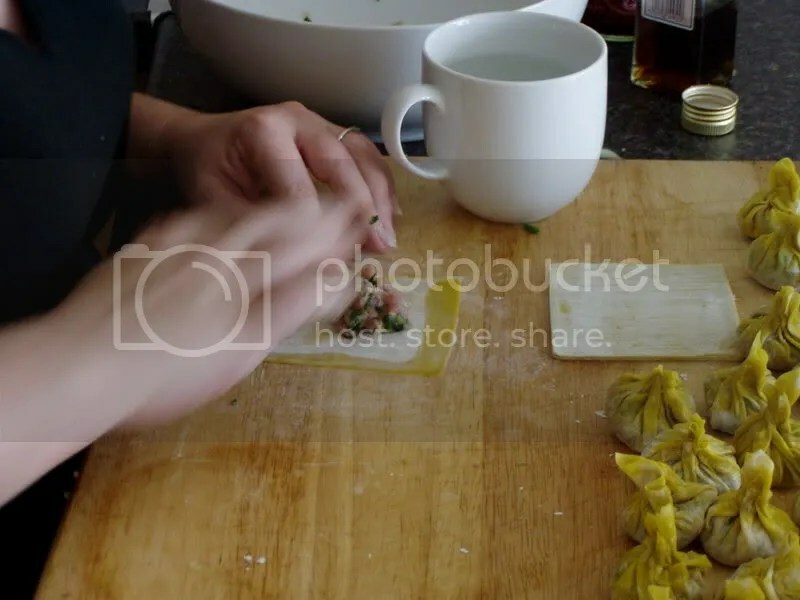 Heat some oil in a non-stick pan and when hot, add the wonton parcels with the twists upright. Fry them for a couple of minutes and then thow in a cupful of water and put a lid on the pan. Leave it to steam for 4-6 minutes, by which time the water will proably have been absorbed and it will be cooked. Serve straight away with some dippy sauce like soy sauce or sweet chilli sauce or whatever you fancy. Very nice. It is great! And surprisingly easy. These sound really tasty!! I bet you can also make them with chicken or seafood. I am always on the lookout for great recipes and if you would like to check out some great cookware, visit onestopcook. They have some of the best cookware around!! Where do you live? I just bookmarked your site . . .